The MWCA experience will be relevant for everyone who has anything to do with mobility applications. MWC Americas 2018 is expected to garner the attention of the key players in the mobile industry and encourage them to reimagine what the future of mobility looks like. When 25000+ attendees will assemble to understand and redefine the mobility landscape, the world will have so much to talk about Mobile World Congress Americas. The surge of 1,000+ exhibitors will attract businesses from all industries to discover what they need to bring in mobile digital transformation in their enterprise. Augmented Reality, IoT / M2M, Wearables, Artificial Intelligence, and Blockchain are just some of the technologies changing the way businesses streamline their operations now and forever. 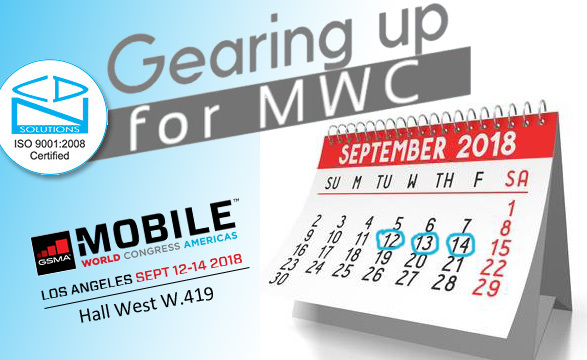 GSMA MWC Americas will boast of people coming together from 110 countries and territories to gain insights, explore leading technologies, and partner in creating a future that is on the go! The technology partners at MWC Americas will bring forth their best innovations- in terms of the most pressing, industry-specific challenges they aim to solve with their mobility solutions. Businesses that want to leverage technology, but aren’t sure of the what and the how will be able to capitalize on IT consultancy at MWC Americas 2018. For others, it is a way to hire onsite resources from the best pool of web and mobile app development companies and developers. No matter what their agenda, businesses from all walks are expected to attend MWC Americas 2018 this year between September 12-14. However, there’s something else about Mobile World Congress America- the fact that it is not just about mobile phones! Wearables are a hit at this mobility conference where developers and mobile app development companies gather from all around the world to check the hot and new in the wearables space. Several tech tours packed into the schedule for Mobile World Congress Americas 2018 tell us a tale. Emerging Tech Tours this year will guide the attendees through the developments in new tech across all mobility devices, including wearables. Businesses can find out which technologies are ruling their industry and get a headstart in leveraging them. Emerging technologies are occupying a lot of space in all businesses and it pays off to learn which ones are under testing, which ones have hit the markets, and which are yet to be innovated. Plan investment of your resources strategically by getting to learn firsthand which technologies are rapidly shaping the mobility landscape of tomorrow. Wearables are a great place to start when businesses think about getting digitally transformed on the inside. Enterprises now consider wearable devices a part of their workforce’s uniform. This is especially true for the organizations that have to keep track of a mobile and remote workforce. Integrating wearables into the daily operations of an enterprise is a sure shot way of ramping up processes and making operations more efficient. Innovations and strides in the wearable tech space will be frequently seen at the Mobile World Congress Americas this year. To touch upon the subject of the use of wearables in the digital marketing space, MWC Americas has an event lined up to discuss the latest trends in digital marketing. Some of the leading companies around the world will showcase their tools and services to give you an idea of the next gen of digital marketing. So to say, wearables happen to be a part of this event too, apart from other technologies such as VR, AR, or AI. The realm of connected cars is not in the future anymore, but very much in front of us. This may have been the reason why connected cars have found a spot in this year’s finest mobile industry event in Los Angeles. The SDL connected car conference by FordDev will take place on the opening day of the event. Businesses wanting to become a part of the connected cars space can attend the conference and learn more about the exciting opportunities in this arena. Automakers can learn about monetizing car connectivity and bringing mobile apps closer to millions of drivers around the world. The event will also highlight the importance of privacy and security in this increasingly open world. Attendees can bring in their ideas for a connected app to the hackathon and compete with peers for great prizes and an opportunity to get their SDL-enabled app accessible to millions of vehicles all around the globe. Huge players have made immense success connecting cars and their drivers to each other through mobility solutions. Even so, there is a lot of scope in this space, waiting to be unleashed. Connected cars point us towards a not-so-different kind of mobility solutions than what we were originally expecting to see at the MWCA Los Angeles this year. Investments in developing smart cities are not only adding to the overall efficiency of government operations and citizens’ lives but also making processes sustainable. This is the idea behind the Sustainable Smart Cities Tour on the opening day of MWCA 2018. Overall connectivity in any city improves its productivity and opens up a window of opportunities to solve challenges and build solutions. But, the forward-thinking leaders of today want to leverage mobility to add sustainability to their smart cities. This concept of a smart city touches base on the three key areas of development- People, Planet, and Profits. From overhauling the transportation systems to reimagining waste disposal, there is nothing that cannot be achieved with the strategic addition of mobility devices and solutions to a smart city plan. In this regard, smart cities is another area for the applications of mobility solutions that will go beyond the idea of mobile phones. CDN Software Solutions is exhibiting at the MWC Americas 2018. We bring to the table a wealth of experience and expertise in building the best mobility solutions that cater to industries far and wide. After delivering 2200 projects in web and mobile app development, we are keen on taking up your most pressing challenges and suggest you the best course to leverage technologies for your benefit. We have a proven record of helping businesses chalk out an IT strategy and lay down a roadmap to help them bring in digital transformation through mobility solutions. For a reliable technology partner at MWCA, look for us at Hall West Stand W.419. We are ready to discuss mobile enterprise solutions and services with you. Let’s convert challenges to solutions!